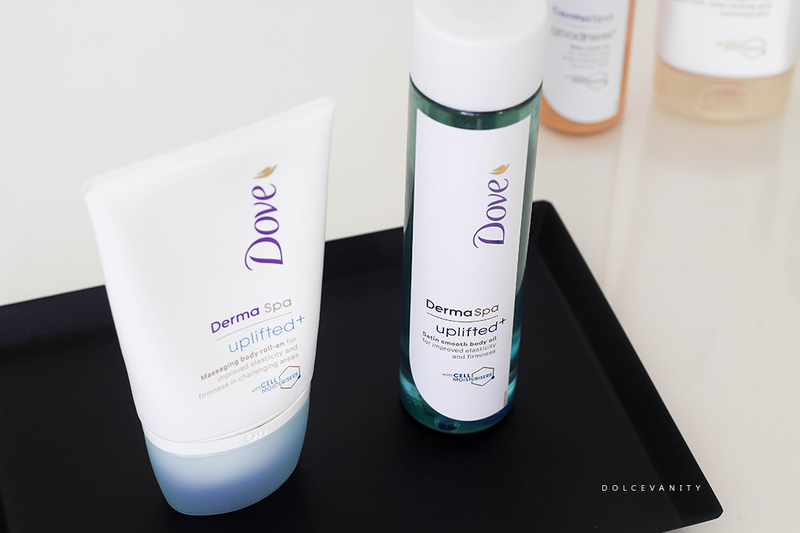 Today I'm talking about two of three products available from the Dove Uplifted+ range. Aimed at restoring and repair thirsty skin, with feather-light lotions, that'll provide deep penetrating moisture and nourishment to help firm skin. This one I was more interested in because it's not often I see a moisturising product with the rollerballs attached? Combination of toning massage gel and a gentle roll-on. It's easy to use, slide the trio of rollerball heads to the on position, hold the tube firmly and press the rollerballs against the skin to release the silky satin gel - massage in a circular motion. This one is nice, the gel and rollerball provide a cooling but a relaxing experience. I like to use this on my stomach and thighs. Just laying back after a shower or bath, roll this on. I'm shocked at how lovely the skin feels afterwards - I sincerely hope this helps with firming and elasticity. It's got that slight Dove scent but has something more sweet and floral about it. It is not a thick oil, more watery in texture. The way it performs reminds me of a dry oil - although not marketed as one, because it absorbs quickly & leaves no grease. The skin felt firmer after a few days of continuous use. Especially as I was using the massaging body roll-on with it. As I use this in targeted places and not a great deal is needed, I can see this bottle lasting a little while. 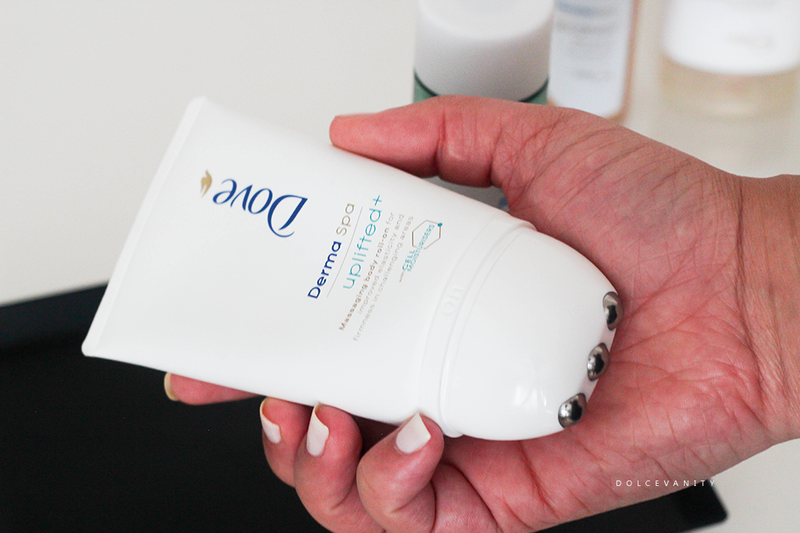 Interesting - I didn't know these products existed - and I do use and love the basic dove range. I can see myself being tempted! Yeah Dove are really expanding more, it's hard to keep up sometimes lol. The rollerball has me fascinated - what a unique product! I know, right!? It's becoming a habit me just rolling it over my stomach lol. It's very cooling on the skin and because I'm currently losing weight, I've been rolling it on my stomach to help the firmness. The skin feels taut after use but I'm not sure if it's a mind over matter situation. These products have immediately been put onto my shopping list. They sound perfect for my dry skin. Amazing - love to be an enabler. I hope you enjoy them. Exactly, I've not come across anything like it yet. Dove have definitely introduced it to me if it's been done before but it does remove that as I know a lot of people aren't keen on sticky hands. Right, I do change up my products when it comes to winter - need a lot more care. Rich moisturising. Yes - I hope you see them, they'll make great gifts too. I have dry and oily skin so it does need some hydration and luckily this sounds like it would do just the trick! I love an oil and my skin does too. Takes quite a while for my skin to dry out using rich oils / creams. Thank you! Oh I love having Dove scents around - I need a Dove candle. The roll-on definitely has my interest. I'd be willing to give it a shot! It's very interesting, my friend loved trying it also. I have never tried a dove product that I didn't like. It always leaves my skin so soft. Woman after my own heart - it's an amazing brand. The massaging body roll-on sounds great, my mummy would find that really relaxing! Those sound like great products. I have such dehydrated, dry skin at the moment - I need these. This may help but may not as I know dehydrated skin lacks water while dry skin lacks oil. oh wow I love the look of the body roll on oil!! Its sounds great to especially that it doesn't leave you feeling oily after! Yeah as much as I like my skin to shine, I don't want it to slide lol. Definitely a lot of people can be like that, me included. Makes it a lot more easier for sure. The roll on product sounds most appealing, I might check it out! It seems to be a firm favourite so far. I haven't seen this before, sounds like a really lovely product, I'll keep an eye out for it. Yes Dove are expanding nicely with their brand. I haven't tried these before, I need to try more Dove products! Dove is a good brand plus it's widely available making purchasing easy. The roll on massage oil sounds good, it's a nice and simple way to apply the product. It is, fuss free - totally agree.